Summary : Yet another great tea from Numi. This organic earl grey tea tastes great, has some kick to it and really does make for a very good morning tea. What is nice about this tea is that it doesn't use pepper...so if you dislike some earl grey teas due to the pepper infusions they use, you'll find a "home" with this tea. Review : It is suppose to be below zero tonight. No big deal, right? Well, in Nevada below zero weather isn't exactly common. Indeed, to put it bluntly, this weather stinks. And as Nevada dwellings aren't the most insulated of buildings on the face of the earth, my heater is constantly running and yet I'm still freezing. Times like this, I wish I loved in Hawaii. But alas...we can't have everything in life. And since I'm shivering away in front of my computer, I realized I needed something to "warm me up," and of course, the beverage of choice for this is tea. I also had some work to do, so decided some "kick" was needed in my life right about know. So...I poked through a Numi Sampler box I had and found a earl grey tea...one of my favorite black teas. Here is how Numi describes their earl grey tea that has the long winded name of Aged Earl Grey Italian Bergamot Black Tea : "Earl Grey is one of the most popular teas, yet remains mysteriously beckoning. As the story goes, Charles Earl Grey, a 19th century British Prime Minister, was gifted this scented tea in gratitude for saving the life of a Chinese man. The secret to its lingering aroma is the pear shaped bergamot orange, called the The Fragrant One. Most Earl Greys utilize bergamot oils or flavorings. 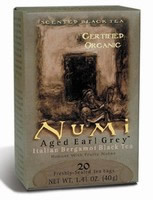 Numi's special, organic Earl Grey is oil-free-using a unique method of aging this Italian bergamot fruit with malty Sonitpur Assam black tea. When brewed, it imparts an exquisite red-orange hue that calls to mind dawn's finest moments. Balanced and stunning, we've recreated this timeless classic." All I can say is...whoever rights up the tea descriptions for Numi really does deserve a raise if not a big promotion. You rarely understand the description, yet the description makes the tea seem somehow special and exotic. Well, forgetting about the lofty description, let's concentrate on the tea here. First off, right out of the bag, this tea definitely is potent. It has the very strong aroma of, what else, an earl grey tea! Yet...for pepper haters of the world...you'll discover that there is no pepper in it. Thus, sniffing this tea won't make you sneeze. As for the flavor of the tea, well, its a relatively spicy earl grey tea. No better way to describe it really. Oh, perhaps this will help. The flavor is very, very good. Truthfully, it's the best "bagged earl grey tea" I've had. And while I don't mind pepper in my earl grey teas, admittedly, pepper isn't my favorite infusion. Hence, I really liked how pepper was a missing ingredient here. In any event, if you are a lover of earl grey teas, you owe it to yourself to give this tea from Numi a try. It may not quite rank up there with a quality loose-leaf earl grey tea, but it is darn close. Recommendation : Yes. This is an excellent earl grey tea that manages to be a bit on the spicy side without using any pepper. Plus, like most other Numi teas, this earl grey tea is organic too.